Technology - DarwinAI: Evolving the way we build A.I. DarwinAI™ facilitates the automatic generation of highly optimized neural networks and explainable deep learning through our unique Generative Synthesis™ A.I. technology. Shown on benchmarks to automatically build powerful deep learning A.I. solutions as much as two orders of magnitude smaller than state-of-the-art deep learning A.I. Accelerating A.I. on the Cloud. Enabling A.I. on the Edge. ​can run TWENTY of them at the same time. ​DarwinAI's revolutionary Generative Synthesis™ A.I. technology was also able to automatically build deep learning A.I. solutions with a OpenPose body estimation-like model architecture that are so efficient that, when leveraging the Tensor Cores on the Nvidia's Tesla V100 GPU, can process more than 36 video streams in real-time! 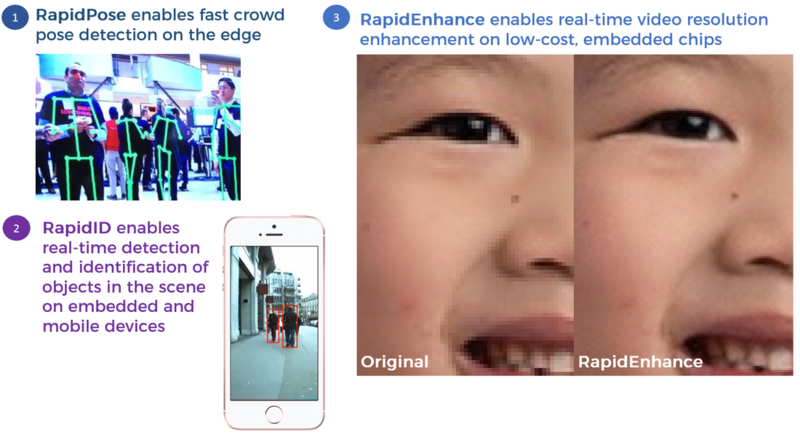 ​DarwinAI's RapidID™ family of real-time object detection solutions, which includes Tiny SSD, enables the localization and identification of objects in a scene beyond real-time speeds, empowering embedded A.I. on the edge. 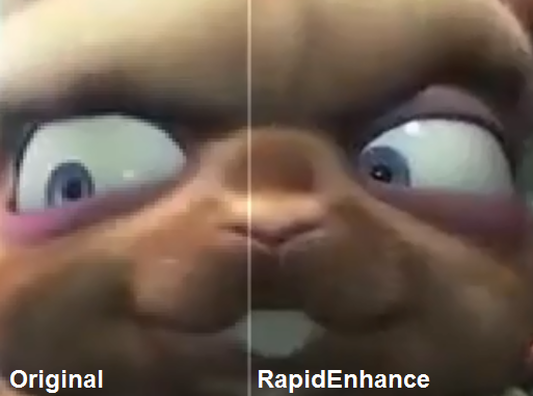 DarwinAI's RapidEnhance™ video enhancement solution, built using our revolutionary Generative Synthesis™ A.I. technology, can turn low-quality video content into high-quality video content on the fly on a mobile chip. With a focus on operational deep learning, DarwinAI's team of renowned, award-winning experts have worked with a large portfolio of industrial clients in a wide variety of sectors, and are accelerating breakthroughs in A.I. research and application to enable artificial intelligence anywhere, anytime. Mohammad Javad Shafiee (PhD) is a research professor at the University of Waterloo, and the co-inventor of DarwinAI's Generative Synthesis A.I. technology. Mohammad is a world-class researcher in computational intelligence and deep learning, with more than 70 peer-reviewed scientific articles at top journals and conferences. His research has been recognized with a number of prestigious awards, has extensive industrial research experience leading a large number of large-scale industrial and academic projects. Sheldon Fernandez (CEO) is a seasoned executive and respected thought leader in the technical and enterprise communities. Throughout his career, he has applied emerging technologies such as Artificial Intelligence to the enterprise. First, in his capacity as CTO at Infusion, the company he founded out of school with five partners that grew to 600 people. Then subsequently, at Avanade, the organization that acquired Infusion in March of 2017. Sheldon is also an accomplished author and speaker. He has spoken at numerous conferences in numerous contexts, including Singularity University, the prestigious think tank in the Bay Area, and has written technical books and articles on many topics. Through his career, Sheldon has coupled his entrepreneurial endeavors with non-technical pursuits, resulting in an interdisciplinary approach that is critical to the intelligent application of AI. He completed a Master’s degree in theology at the University of Toronto in 2008, with thesis work in neuroscience and metaethics. He also pursued creative writing at Oxford University. Arif Virani (COO) is a trusted leader with a track record in innovative technology adoption. He has helped Fortune 500 companies plan technology investments, develop employee skillsets, and implement large-scale initiatives. He started his career building trading systems for investment banks on Wall Street, and then transitioned to McKinsey and Company where he was a leader in their Business Technology and Digital practice. Most recently, he co-founded an advanced analytics solution within McKinsey’s New Ventures division. He shaped the go-to-market strategy and created product roadmaps as an advisor to Artificial Intelligence startups. Arif completed his Master’s in Business Administration at the University of Pennsylvania’s Wharton School and his Bachelor’s in Applied Science (Computer Engineering) at the University of Waterloo. Brendan Chwyl (MASc) is the resident edge computing platforms and visualization R&D guru for DarwinAI. Brendan has extensive industrial research experience working with some of the largest companies in the world, as well as significant experience in computational intelligence and deep learning. Francis Li (MASc) is the resident infrastructure and optimization R&D guru for DarwinAI. Francis has extensive industrial research experience working with both startups and large corporations, as well as significant experience in computer vision and machine intelligence. Shelley Wang (PhD) is an adjunct professor at the University of Waterloo, and a data scientist at DarwinAI. She manages research operations and logistics. Shelley has considerable academic and industrial research experience in statistical learning and modeling and machine learning, with over 20 scientific publications at top journals and conferences. Dave Dolson (MASc) is a seasoned technical leader and principal architect at DarwinAI. One of original employees at Sandvine, he has wealth of experience across all facets of the development lifecycle: architecture, infrastructure, development and testing methodology, and product release cycles. Dave also possesses broad experience in delivering architectural leadership for high-performance real-time products, and has extensive industrial experience developing industry-leading software in the areas of graphics acceleration, automotive control, MPEG encoding, and deep-packet inspection. Prior to Sandvine, he completed his Master’s degree at the University of Toronto in Artificial Intelligence specializing in neural networks, and was a teaching assistant to Geoffrey Hinton. He has authored and edited a number of Internet standards documents, has spoken at international conferences, and is the inventor of multiple patents. Michael St. Jules (MSc, MMath) is a research developer at DarwinAI who brings his unique academic background in pure mathematics and theoretical computer science to the team. Michael has presented in the top conference in quantum cryptography and has since focused on machine learning, with both academic and industrial research experience in the field.